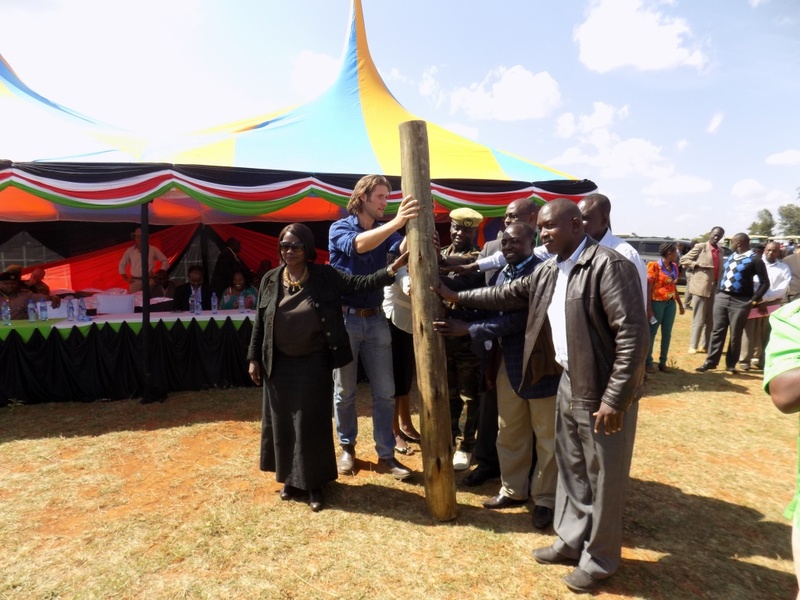 Judi Wakhungu, Kenya’s minister of environment and natural resources (left), joins Dr Max Graham, chief executive of Space for Giants (second left) and Joshua Irungu, the former Laikipia County Governor (fifth left) and others at an event to launch the construction of an electrified elephant fence. We do all of this unashamedly. The time to safeguard once and for all the wild spaces of this world is short. In Laikipia in Kenya, where I’ve been based for nearly 20 years, farmers like Paul Njoroge are raising harvests undisturbed by crop-raiding elephants thanks to a pioneering electrified fence Space for Giants designed and built. To the north, on 56,000 acres of habitat we helped save and now help manage as a wildlife conservancy, cattle owned by neighbours like Edward Letouwon are healthier thanks to better grazing they access, and vet services the conservancy provides. And in nearby courtrooms, investigators, prosecutors and magistrates we helped to train are throwing the full force of Kenya’s new wildlife crime laws – which our specialists helped to draft – at criminals like David Mwariama, found illegally with 43kg of ivory, and Zachary Mboya, found with just 600g. Both are today in prison. In a recent book review published by The Ecologist, Lewis Evans characterised my organisation, Space for Giants, as “primarily” focused on PR while doing “little on the ground”. That is inaccurate, and, we felt, unfair. The Ecologist has given me this article to explain why. Space for Giants exists – not just primarily, but entirely – to protect forever the critically important natural landscapes that Africa’s elephants need to survive. We know this land could have other uses. It could be intensively grazed, or settled and farmed piecemeal, or sold to agricultural corporates. Each would generate revenue, and provide employment. But our aim is to make sure that leaving the land wild brings in the most advantages, the most money, and gives the most people a job, over the longest time. To do that, elephants must do no harm to local people, so they stop being a dangerous nuisance, and begin instead to earn them something, so they become valuable assets. That’s why we helped build those fences in Kenya, and now in Gabon and we expect soon in Botswana and Uganda, to block elephants from crossing into human territories and destroying livelihoods like Mr Njoroge’s and causing injuries or fatalities. It’s why we collar the most notorious crop-raiding elephants so we can study them. So far, Space for Giants research has fed three PhDs and four Masters’ theses and created one of the single largest databases on human-elephant conflict and how best to manage it. It’s why we help preserve conservation areas like the one near where Mr Letouwon lives, because wildlife is a major tourist attraction, and tourism pays taxes and provides jobs. In Kenya it directly employs 400,000 people, and indirectly more than a million. Tourism’s share of Botswana’s GDP is predicted to grow by 8.5 percent this year. In Uganda, tourism jobs are set to increase by 15 percent. To protect the valuable assets that wild animals become, we train and equip frontline rangers. A Rapid Response Team we helped set up in Kenya in 2012 helped drive an 84 percent drop in poaching there in three years, arresting people like Mwariama and Mboya. Today, we’re training a further 170 rangers in Kenya and working with Botswana’s authorities to train and mentor a specialist anti-poaching unit. All of this is the “on the ground” work that Mr Evans’ article claimed we did so little of. In fact, Space for Giants goes a great deal further. We’ve worked with judiciaries in Uganda, Kenya and Botswana to create guides on processing wildlife crime scenes, building better prosecutions, and drafting new wildlife laws. With our Giants Club initiative, we link African political leaders with the clout to make things happen to global financiers looking to responsibly invest capital to protect wild spaces and generate value for the people living in or next to them. The Giants Club will host the first Conservation and Tourism Investment Forum in Uganda in October, in partnership with President Yoweri Museveni, and its second Summit in Botswana in 2018, hosted by President Ian Khama. We are launching a Fellowships scheme for African conservation journalists, and lobbying at the highest levels to get our points across. We have a subsidiary firm that arranges sponsored events and supporters’ safaris, driving all proceeds to our conservation work as an innovative way to raise funds. Yes, we need our boots on the ground. But we also need them in the offices of Presidents, in the chambers of Directors of Public Prosecutions, and in the boardrooms of national wildlife services. We need to be on the radar of financiers and philanthropists, in the newspapers shouting about what we know works and why it’s urgently needed, and on the social media feeds of those with global influence who the world listens to. We do all of this unashamedly. The time to safeguard once and for all the wild spaces of this world is short. Space for Giants will use every way we know works to succeed in that endeavour. Dr Max Graham has worked on environment and development projects in Asia, South America and Sub-Saharan Africa. He founded Space for Giants in 2011 after more than a decade researching elephant behaviour and conservation with the University of Cambridge, where we was awarded his PhD. He has published numerous scientific papers on conservation, elephant behaviour and human-wildlife conflict. He lives on a wildlife conservancy in Kenya with his wife, Dr Lauren Evans, also a leading wildlife conservation expert, and their two children.